​CTW Barbarella is now called ELLA and lives in Morrow with Ken and little guy, Wyatt. Wyatt was so excited to have a BIG friend, he was jumping up and down and once Ella knew he was a dog, seemed perfectly comfortable with his excitement. Initially Ella wasn't real sure what he was but a brief walk and lots of sniffing then she realized it was a little dog! Too cute to watch them get to know each other. Wyatt showed her around the house and even shared a toy! 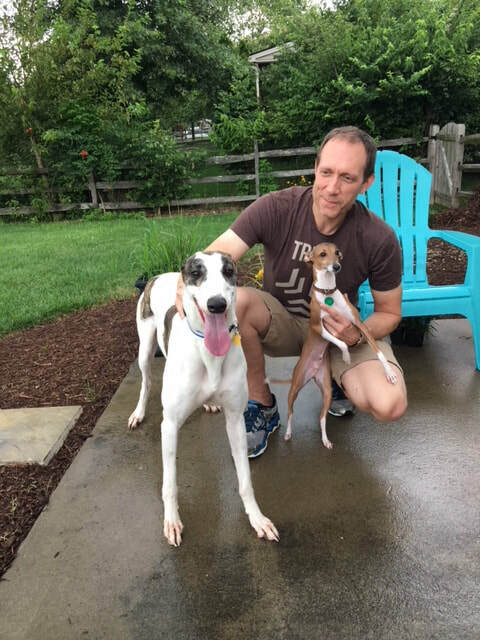 Ken was thrilled how well they got along so quickly, he had always wanted a greyhound and now his family is complete.